Crazy tires. Rad suspension. GLITTER. Watch us bring the bling to GMA! 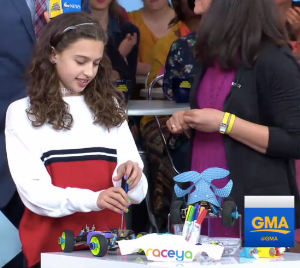 Heather Cabot (co-author of Geek Girl Rising) called RaceYa one of the four Smartest Gadgets for Girls on the May 29 edition of Good Morning America. In case you missed it, see the clip here! "The point is, you can customize the cars to fit your personality." A few weeks back we talked a lot about springs and how they made your ride smoother. But what if the goalis to make everyday like riding at the way-way back of the school bus? These amazing cars use hydraulics to make their cars jump, bounce and even dance. You know how the kid with the ride-on power-wheels car is always the envy of the neighborhood? Well it turns out that envy never goes away. It just grows up, gets a new motor, a bigger battery and maybe some new tires. Check out power-wheels racing at a Maker Faire near you. Have you ever tried to get into the wrong car in a parking lot because they all look the same? Not gonna happen with one of these Art Cars. We've even seen a few of these driving around NYC! 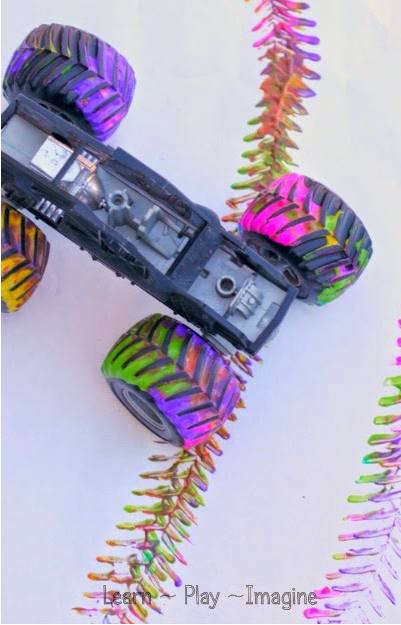 Grab some paint, a few toy cars and a very large piece of paper for a totally different take on the art car. The artful folks over atLearn~Play~Imagine have a few tips. No matter what - always let your flair shine through.